Aims and Objectives: The present study aims to evaluate the impact of oral health education on oral hygiene knowledge and plaque control of school-going children in the city of Amritsar. Materials and Methods: The study was carried out for 6 weeks and included four groups of schoolchildren of 10–12 years of age. Children were randomly selected and assigned into one of the four groups – Group I (verbal communication), Group II (verbal communication and self-educational pamphlets), Group III (audiovisual aids and verbal communication), and Group IV (control group). Oral health education was assessed by getting a questionnaire filled by children and plaque scores was recorded using Silness and Loe plaque index before and after the study. The data were then compared and analyzed using SPSS 16 software manufactured by IBM. Results: Differences in knowledge gain after the dental health education were statistically significant between all the groups, except between Group II and Group III in which the difference was not found to be significant. Group III showed the highest decrease in plaque score followed by Group II. There was a significant difference in reduction in plaque scores between all the groups, except between the Groups II and III. Conclusion: Both methods, i.e., pamphlets and audiovisual aids when used along with oral lectures, are equally effective in improving the knowledge and plaque scores in children. Oral diseases are considered to be one of the most prevalent conditions in the world and are usually preventable. It has been substantiated that factors affecting growth of dental plaque and inflammation of gingival tissue leading to periodontitis are ubiquitous and strongly allied, irrespective of age, gender, or racial/ethnic recognition. Oral diseases restrict activities in school, at work, and even at home causing a number of school and work hours to be gone astray each year in the whole world. Moreover, these diseases have the psychosocial impact that significantly deteriorates the quality of life. There are many factors playing a key role in the motivation of patients in maintaining oral health. Most significant among these factors are patient's appreciation of the disease and the familiarity of various precautionary measures. Schools offer an effectual podium for imparting oral health education because they can reach over 1 billion children globally. The oral health and well-being of school staff, parents, and community members can also be improved by conducting school dental health programs. Oral health education can be reinforced right through the school years, which are the most significant years of children's lives, and it is the period during which lifetime way of life, skills, and attitude are developed. The most frequently used manner of deliverance of oral hygiene messages is the individual tutoring approach on one-to-one basis. In spite of being effective in improving oral hygiene and gingival health, this approach is time-consuming and may not be realistic from a community standpoint. Replacement of an individual instruction by other modes of dental health education (DHE) has been investigated, such as employing the use of self-educational manuals, pamphlets, and audiovisual aids. There is a scarceness of journalism in terms of comparing the influence of numerous methods of school-based DHE programs in India, and this is deserted in provisions of health promotion in public health. Studies conducted so far have compared the combined modes of delivery of oral health education with pamphlets and audiovisual aids  or oral health education has been compared with chalk and board method of oral health education. None of the studies has compared that whether audiovisual or pamphlets along with oral lectures can be better used for school DHE. Hence, the present study was planned to evaluate the oral hygiene related knowledge and plaque scores of 10–12-year-old schoolchildren of Amritsar city before and after oral health education. The study was carried out in four schools (similar in socioeconomic status and level of teaching) of Amritsar city (Punjab, India) for 6 weeks during the period from May 2016 to July 2016. Participants of this study encompassed 200 children of 10–12 years of age. After verifying from the district health education, it was found that there were 25 such schools of such same socioeconomic status. Out of that, using stratified simple random sampling, four schools were randomly chosen and 50 children aged 10–12 years comprising one respective group were chosen from the respective schools. Children seeking a dental checkup regularly or receiving DHE from another source and/or physically or mentally or medically compromised children were excluded from the study. Consent to conduct the study was obtained from the ethical committee of the institution(Ethical approval letter no.504/ IOSR/2016) and from the principals of the particular schools. A parent–teacher meeting was called where the parents were explained about the study in detail, and informed consent was sought depending on their willingness to participate in the study. Fifty children from each school were chosen randomly to form groups, making a total of 200 children in the study. The study was a double-blinded, randomized controlled field trial. The four schools were divided randomly into four groups: group I, Group II, Group III, and Group IV containing 50 children in each group. The first, second, and third groups received oral health education (experimental groups), while the fourth group was kept as a control group. On the decided dates for each school, all the selected participants of the individual schools were sought to gather in their classroom. Children's oral health-related awareness was estimated by an investigator using a questionnaire. The children were assessed using a pretested, structured close-ended questionnaire which included questions regarding their knowledge and attitude toward oral health. A pilot study was done on 20 children to check the validity of the questionnaire and those children were not included in the study. After checking for the validity of the questionnaire, the children included in the study were briefed regarding the questionnaires and were instructed not to leave any answers vacant. Adequate time was given to the children to think and answer. On a subsequent day, plaque score was recorded using Silness and Loe plaque index. The examiner was blinded to the group to which children were enrolled into. Clinical examination was done by a single trained examiner (intra-examiner reliability 0.7). The examiner was trained to record the plaque index under the supervision of the staff before examining the study group. Examination was carried out in the school premises. Children were made to sit in a chair comfortably and plaque scores were recorded under natural-lightening conditions. This group received a widespread program consisting of a single information session related to the etiology and prevention of dental diseases and oral hygiene maintenance. The method of imparting oral health education was verbal communication. This group received a program similar to Group I, i.e. verbal communication but along with self-educational pamphlets which were briefly explained to the children and were then allowed to carry those pamphlets to their homes. This group received oral health education through verbal communication along with audiovisual method shown in the schools. The children in this group received no educational session or oral hygiene instructions and served as the control. Children's oral health-related knowledge was checked by the same investigator using the same closed-ended questionnaire after 6 weeks of imparting oral health education. Plaque scores for all the children were also re-recorded by the same surveyor using Silness and Loe plaque index. As it would be unethical to depart any group of the benefits, the control group was also given a similar type of health education after the Stage III. Data were analyzed and the mean knowledge and plaque scores in the four groups were calculated. Within the group, comparisons for knowledge scores were studied using paired t-test. For intergroup comparisons of knowledge scores, analysis of variance and post hoc tests were used. Plaque scores were analyzed using pair signed test. Intergroup comparisons for plaque scores were performed using post hoc test. 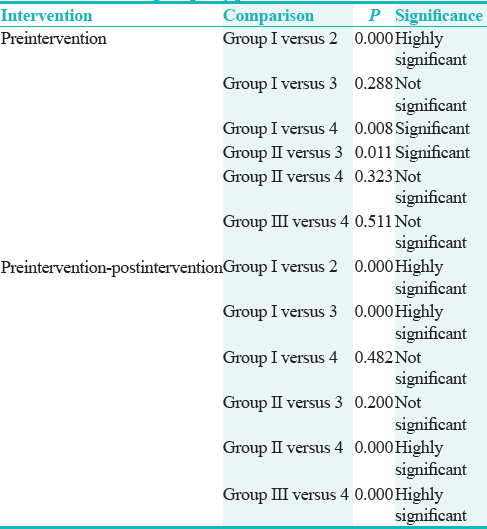 Differences in knowledge gain were statistically significant between all the groups, except between Group II and Group III in which the difference was not found to be significant [Table 1]. Highest increase was found in Group II followed by Group III and then in Group I and Group IV (control group) showed the least increase in knowledge score [Table 2] and [Table 3]. Group III showed the highest decrease in plaque score followed by Group II and then Group I and least decrease was found in Group IV [Table 2] and [Table 4]. 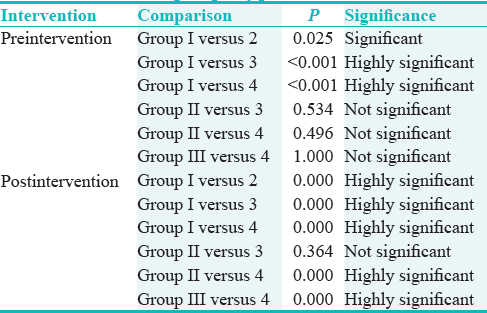 Intergroup comparison showed that there was significant difference in reduction in plaque scores between all the groups, except between the Groups II and III [Table 5]. Schools are the influential setting for secondary socialization. Students can be accessed easily during their school years, time period that runs from their childhood to adolescence. These are influential years when lifelong health-related behaviors, as well as way of life and attitudes, are being developed. Children are predominantly amenable during this period, and earlier, the habits are established, the long lasting is the impact. School health programs are significant for promoting oral health of children and as well as of youth. Oral health education can be provided by either traditional method of giving lectures or by the use of self-educational pamphlets or by audiovisual aids or by combination of two or more. Several other methods can also be engaged to convey effective health education. The present study aimed to compare the effectiveness of these various methods in improving oral hygiene knowledge and plaque control in school-going children. Highest increase in knowledge score was found in Group II followed by Group III and Group I and lowest was in Group IV (control group). Groups II and III did not show significant difference among themselves in relation to increase in knowledge score [Table 1]. Thus, the audiovisual aids and self-educational pamphlets may have had a greater and equal impact on the children and most likely could have aroused curiosity in the subject, leading to better increase in knowledge. A statistically significant improvement in knowledge was seen in Group IV after 6 weeks though the improvement was less when compared to Groups I, II, and III. This may be accredited to Hawthorne effect (Hawthorne effect is a form of reactivity whereby subjects improve an aspect of their behavior being experimentally measured simply in response to the fact that they are being studied, and not in response to any particular experimental manipulation.). The present study also assessed the transformation in plaque scores in the experimental and control groups after 6 weeks of intervention. When evaluated after health education, it was found that the mean plaque scores had lowered in all the four groups significantly. Children in the control group (Group IV) did not obtain any oral health education program during this study; they showed a little improvement in their plaque scores. This may be attributed to the fact that children might have developed interest to gain knowledge about several aspects of oral health through other sources (Hawthorne effect). On comparison of the four groups, highest improvement in plaque score was seen in Group III, followed by Group II, Group I, and Group IV [Table 4]. The plaque scores of Group II and Group III were not statistically significant [Table 5]. Both the groups showed equal reduction in plaque scores, and it can be concluded that either of these methods can equally be used to impart oral health education to the children and these methods can equally bring about a change in oral hygiene practices among them. Results shown by Group II are in accordance with the study conducted by Chandrashekar et al., who used brochures for oral health education in children of age 12–15 years. The study also showed a significant reduction in plaque scores after oral health education. The results shown by Group I were in accordance with the study conducted by Shenoy and Sequeira, which assessed the effectiveness of school DHE conducted every 3 weeks on oral health knowledge, practices, oral hygiene status, and gingival health of schoolchildren. Plaque and gingival score reductions were highly significant in intervention schools in which DHE was given. The present study suggested that school DHE can significantly help improve oral health knowledge and oral hygiene. These results are in accordance with certain studies conducted by Kay and Locker, Pakhomov GN et al. The results of the present study are also in accordance with the study conducted by Naidu and Nandlal, which also supports the implementation of such programs in schools. Another study done by Relwani et al. on special need children also concluded that oral health education can effectively be used to improve the oral hygiene of the children. Kumar et al. also concluded that oral health guidelines including good dental hygiene and dietary habits can thus be an effective intervention aid for teaching the basic oral health concepts among school-going children. A shortcoming of this study was its shorter duration. However, the results of this study are in accordance with the findings of Aljafari et al., Gaare et al., and van Palenstein et al. that better dental health can be brought about by oral health education alone. It should be remembered that once affective knowledge pertaining to oral health have been recognized at a younger age, they could later be a factor in improving the oral health-related behavior of the next generation, when the present children become parents. The parents were not included in the study. It is believed that parental involvement and long term follow ups could better lead to the effectiveness of the oral health education program. Long-term follow-up of the program needs to be conducted to evaluate the long-term impact of the program on oral health practices. The effects of culture and socioeconomic status on the oral health knowledge and practices should also be investigated in the future. The present study concluded that the mean knowledge scores of children enhanced after 6 weeks of provision of oral health education. The mean plaque scores of children decreased in the experimental group after the intervention. When used along with oral lectures, oral health education was found to be most effective when used with audiovisual aids as well as with self-educational pamphlets. Hence, both these methods when used along with oral lectures are equally effective in improving the knowledge and plaque scores in children. However, further longitudinal studies relating manifold oral health education sessions engaging children, teachers, and parents with frequent follow-ups at regular intervals to study the preservation of knowledge after discontinuation of oral health education are needed. Watt R, Fuller S. Practical aspects of oral health promotion. In: Pine CB, Harris R, editors. Community Oral Health. London: Quintessence Editions Ltd.; 2007. p. 357. Albandar JM, Rams TE. Global epidemiology of periodontal diseases: An overview. Periodontol 2000 2002;29:7-10. Lim LP, Davies WI, Yuen KW, Ma MH. Comparison of modes of oral hygiene instruction in improving gingival health. J Clin Periodontol 1996;23:693-7. Singh N, Ramakrishnan TS, Khera A, Singh G. Impact evaluation of two methods of dental health education among children of a primary school in rural India. Med J Dr DY Patil Univ 2016;9:66-71. Hebbal M, Ankola AV, Vadavi D, Patel K. Evaluation of knowledge and plaque scores in school children before and after health education. Dent Res J (Isfahan) 2011;8:189-96. Peter S. Essentials of Preventive and Community Dentistry. 2nd ed. 2003: Arya Medi Publishing House; Delhi. p. 534-58. Chandrashekar BR, Suma S, Sukhabogi JR, Manjunath BC, Kallury A. Oral health promotion among rural school children through teachers: An interventional study. Indian J Public Health 2014;58:235-40. Kay EJ, Locker D. Is dental health education effective? A systematic review of current evidence. Community Dent Oral Epidemiol 1996;24:231-5. Pakhomov GN, Moller IJ, Atanassov NP, Kabackchieva RI, Sharkov NI. Effect of an amine fluoride dentifrice on dental caries used in a community-based oral health education program. J Public Health Dent 1997;57:181-3. Naidu J, Nandlal B. Evaluation of the effectiveness of a primary preventive dental health education programme implemented through school teachers for primary school children in Mysore city. J Int Soc Prev Community Dent 2017;7:82-9. Relwani AH, Kiran S, Bhatt R, Patel M. Impact of dental health education on “Specific learning needs” children. Int J Clin Pediatr Dent 2016;9:31-4. Kumar Y, Asokan S, John B, Gopalan T. Effect of conventional and game-based teaching on oral health status of children: A randomized controlled trial. Int J Clin Pediatr Dent 2015;8:123-6. Aljafari A, Rice C, Gallagher JE, Hosey MT. An oral health education video game for high caries risk children: Study protocol for a randomized controlled trial. Trials 2015;16:237. Gaare D, Rølla G, Aryadi FJ, van der Ouderaa F. Improvement of gingival health by toothbrushing in individuals with large amounts of calculus. J Clin Periodontol 1990;17:38-41.
van Palenstein Helderman WH, Munck L, Mushendwa S, van't Hof MA, Mrema FG. Effect evaluation of an oral health education programme in primary schools in Tanzania. Community Dent Oral Epidemiol 1997;25:296-300.